About 60% of the world’s LPG output is got from natural gas processing and only 40% comes in from crude refining.Because of this, Auto LPG Prices do not follow Crude Oil Price graph and per litre price of Auto LPG has managed to hover around being 40% lower than that of Petrol in most of the Indian cities.The above well explains why the auto LPG filling stations across the country have been doing very well consistently and more and more companies are announcing their plans to set up more number of stations across the country.Low filling times and the 40% fuel cut is a reason enough for a consumer to convert his vehicle to LPG. Warming up to all the action with more than 1100 stations in the country now and a 14 % growth in Auto LPG in year 2017, India touched 400 TMTPA this year. As it all builds up with Auto LPG already available in more than 500 cities in the country, OEs launching LPG Vehicles aggressively and more and more filling stations coming up, India is poised to become the largest Auto LPG market in the world in the next few years. Low costs of infrastructure and conversion, easy availability, versatility of use and of course, an impeccable safety record make Auto LPG the only viable, un-adulterable, environment friendly alternative auto fuel in India. 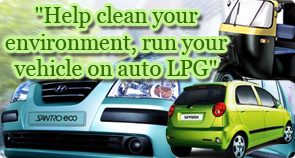 LPG is a clean, high octane, abundant and eco-friendly fuel. LPG is obtained both from natural gas processing through fractionation and from crude oil refining. It is a mixture of petroleum gases like ethane and butane. LPG is a gas at atmospheric pressure and normal temperatures, but it can be liquefied when moderate pressure is applied or when the temperature is sufficiently reduced. This property makes LPG an ideal energy source for a wide range of applications, as it can be easily condensed, packaged, stored and utilised. When the pressure is released, the liquid makes up about 270 times its volume as gas, so large amounts of energy can be stored and transported compactly. Can Auto LPG be used legally? The use of LPG as an automotive fuel has become legal in India with effect from April 24, 2000, albeit within the prescribed safety terms and conditions. Hitherto, the thousands of LPG vehicles running in some Indian cities have been doing so illegally by using domestic LPG cylinders, a very unsafe practice. 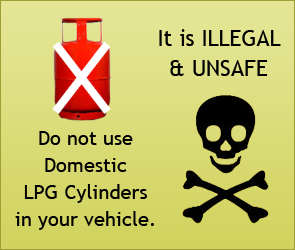 Using domestic LPG cylinders in automobiles is still illegal. Can be used in Passenger cars, three wheelers and two wheelers. Can be easily transported and stored in stand-alone facilities. LPG is pressurized as 7-10 bars as against 200 bars for CNG, which makes it safe and conventional fuel. The automotive use for LPG has an excellent safety record and various crash tests and fire tests proved that owing to the strength and integrity of the fuel tank, it is safer than petrol and at par with diesel. How has Auto LPG fared in world and in India? With a global example to follow of more than 27 million Auto LPG vehicles, supported by 76,000 LPG Filling Stations, no wonder India has recorded staggering growth rates of more than 14% last year and India is well exceed 400 Thousand Tonnes of Auto LPG Sales this year. How safe is LPG in automobiles? Unlike CNG, which is pressurized at 200 bars, LPG is pressurized at just 5-7 bars, which makes it as safe as conventional fuels. The automotive use of LPG has an excellent safety record and various crash tests and fire tests have proved that, owing to the strength and integrity of the fuel tank, it is safer than petrol and on a par with diesel. The conversion of vehicles to LPG has, of course, to be undertaken by a competent person working in accordance with the prescribed standards.